First we give thanks on thanksgiving, black Friday sounds rather creepy to a person that does now know the term. In the USA losing money is going into the red, meaning red ink, well black friday is when a company makes money, or "into the black." Black Friday Defined: Black Friday is the day following Thanksgiving Day in the United States, traditionally the beginning of the Christmas shopping season. On this day, most major retailers open extremely early, often at 4 a.m., or earlier, and offer promotional sales to kick off the shopping season, similar to Boxing Day sales in many British Commonwealth countries. Black Friday is not actually a holiday, but most non-retail employers give their employees the day off, increasing the number of potential shoppers. It has routinely been the busiest shopping day of the year since 2005, although news reports, which at that time were inaccurate, have described it as the busiest shopping day of the year for a much longer period of time. The day's name originated in Philadelphia, where it originally was used to describe the heavy and disruptive pedestrian and vehicle traffic which would occur on the day after Thanksgiving. Use of the term started before 1966 and began to see broader use outside Philadelphia around 1975. Later an alternative explanation began to be offered: that "Black Friday" indicates the point at which retailers begin to turn a profit, or are "in the black". For many years, it was common for retailers to open at 6:00, but in the late 2000s, many had crept to 5:00 or even 4:00. This was taken to a new extreme in 2011, when several retailers (including Target, Kohls, Macy's, Best Buy, and Bealls) will open at midnight for the first time, forcing employees to either go without enough sleep or miss all or part of Thanksgiving with family. A backlash has resulted, with an online petition gathering more than 184,000 virtual signatures urging Target to let their employees have Thanksgiving with their families instead of their employer. 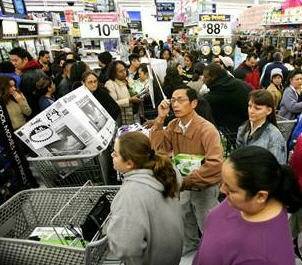 Walmart will open at 10:00 pm on Thanksgiving and Toys 'R' Us at 9:00 pm. In 2010, Sears was open on Thanksgiving day. Because Thanksgiving falls on the fourth Thursday in November in the United States, the day after occurs between the 23rd and the 29th of November. If the day is the year's biggest for retailers, why is it called Black Friday? Because it is a day retailers make profits -- black ink, said Grace McFeeley of Cherry Hill Mall. "I think it came from the media," said William Timmons of Strawbridge & Clothier. "It's the employees, we're the ones who call it Black Friday," said Belle Stephens of Moorestown Mall. "We work extra hard. It's a long hard day for the employees." The Christmas shopping season is of enormous importance to American retailers and, while most retailers intend to and actually do make profits during every quarter of the year, some retailers are so dependent on the Christmas shopping season that the quarter including Christmas produces all the year's profits and compensates for losses from other quarters. Violence Whereas the 1996 film Jingle All the Way depicted a comedic dramatization of somewhat chaotic antics that people may go through in order to achieve their holiday shopping goals, recent years have seen a marked increase in extreme chaos resulting from people's desires to take advantage of Black Friday sales. In 2006, a man in Roanoke, Virginia shopping at Best Buy was recorded on video assaulting another shopper. Unruly Wal-Mart shoppers at a store outside Columbus, Ohio, quickly flooded in the doors at opening, pinning several employees against stacks of merchandise. Nine shoppers in a California mall were injured, including an elderly woman who had to be taken to the hospital, when the crowd rushed to grab gift certificates that had been released from the ceiling. In 2008 a crowd of approximately 2,000 shoppers in Valley Stream, New York, waited outside for the 5:00 a.m. opening of the local Wal-Mart. As opening time approached the crowd grew anxious and when the doors were opened the crowd pushed forward, breaking the door down, and trampling a 34 year old employee to death. The shoppers did not appear concerned with the victim's fate, expressing refusal to halt their stampede when other employees attempted to intervene and help the injured employee, complaining that they had been waiting in the cold and were not willing to wait any longer. Shoppers had begun assembling as early as 9:00 the evening before. Even when police arrived and attempted to render aid to the injured man, shoppers continued to pour in, shoving and pushing the officers as they made their way into the store. Several other people incurred minor injuries, including a pregnant woman who had to be taken to the hospital. The incident may be the first case of a death occurring during Black Friday sales; according to the National Retail Federation, "We are not aware of any other circumstances where a retail employee has died working on the day after Thanksgiving." During Black Friday 2010, a Madison, Wisconsin woman was arrested outside of a Toys 'R' Us store after cutting in line, and threatening to shoot other shoppers who tried to object. A Toys for Tots volunteer in Georgia was stabbed by a shoplifter. An Indianapolis woman was arrested after causing a disturbance by arguing with other Wal-Mart shoppers. She had been asked to leave the store, but refused. A man was arrested at a Florida Wal-Mart on drug and weapons charges after other shoppers waiting in line for the store to open noticed that he was carrying a handgun and reported the matter to police. He was discovered to also be carrying two knives and a pepper spray grenade. A man in Buffalo, New York, was trampled when doors opened at a Target store and unruly shoppers rushed in, in an episode reminiscent of the deadly 2008 Wal-Mart stampede.